On the 29th of November, Middlesbrough based brand Little Anarchy hosted a launch party, showcasing the brand’s unique blend of clothing and photography. Luke Anderson started the project over the summer as he travelled Europe for six weeks creating interesting still images that would be used to promote the event. 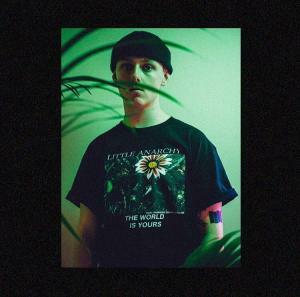 Titled ‘The World Is Yours Collection’, he turned the images into zines, tote bags and t-shirts, all of which were sold on the launch party night. When asked about what inspired the creation of Little Anarchy, Luke said that he has always had a keen interest in fashion. “I wanted to find a new outlet to use my photography, naturally fashion and photography fell together and created the brand. 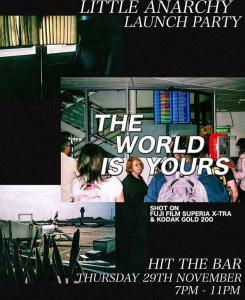 Hit The Bar in Middlesbrough was the location of the launch party, which featured live DJ’s, drinks and sales of the new brands merch. Luke felt that the night went amazingly. The night was a roaring success and is yet another addition to Middlesbrough’s ever growing artistic landscape.